As a part of the PyBay conference next month in San Francisco, I will be co-leading a half-day, hands-on workshop on IoT and MicroPython. This IoT Hackathon is an expanded version of the popular tutorial we have offered in the past at SF Python's Project Night. If you want to know more about the Internet of Things and hardware, this is the workshop for you! 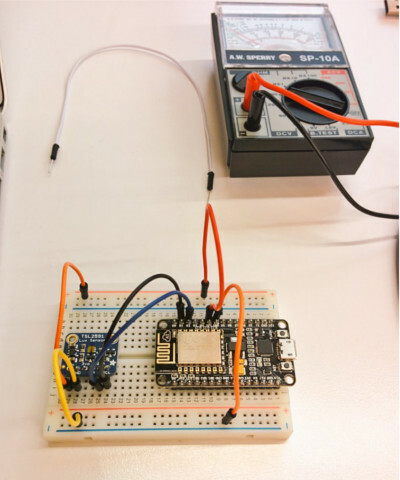 In the first half of the morning, you will learn some basic electronics, wire up a light sensor to a low-power wireless controller board (based on the ESP8266), flash MicroPython into its firmware, and interactively write simple applications to sample and transmit light levels. This system is yours to keep! In the second half of the morning, we will break into teams, brainstorm on projects that build on the basic ESP8266 system, and then implement these ideas, using a provided collection of additional sensors and actuators. At the end of the workshop, each team will get to demonstrate their project. You can learn more on the PyBay website. My co-instructors are Daniel Mizyrycki, a professional Python instructor, and Robert Queenin, a Software Engineer at Industrial Light & Magic. The workshop wil be held on Thrusday August 10 from 9:15 am to 12:45 pm at Bloomberg's office in San Francisco (140 New Montgomery Street). Tickets for this half-day workshop are only $150. You can buy tickets on the PyBay website: http://pybay.com/registration#tickets. Be sure to get them soon, as we are limiting the workshop to 30 people. Here are the slides from the talk that I gave yesterday at PyData Seattle. The video from the talk has been uploaded by the PyData organizers to YouTube at https://youtu.be/rlMb-xwLVUg. Tonight, I will be running a MicroPython and IoT hackathon at SF Python's Project Night. This is a summary of the IoT project described in my BayPiggies talk. I will be giving a talk on Python and IoT next Thursday, October 27, 2016 at the monthly BayPiggies (Bay Area Python Interest Group) meeting.